I love a good cup of java. Add a chocolate biscotti girlfriend and I'm in heaven. These coupons were a great incentive to checkout a new (to me) coffee shop. There was only one hitch. Can you figure out where this marketing tactic went from coffee rich to coffee bitter? 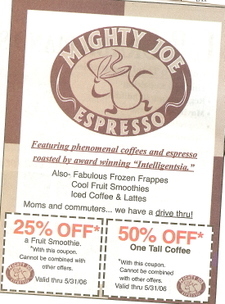 If I were MIGHTY JOE ESPRESSO, I would slap an address or cross-street store locator information on the coupons. A customer can't visit if they don't know where to visit. Dig? Right! Thanks for playing John. This an excellent example of how a "little" detail can negate an entire strategy. Tip: create a master check list at the onset of development. That will encourage you to think through the little details that may be missed in execution. Does John win a free tall coffee? Bruce - that's a great idea or perhaps a pink boa? I'd also suggest - if they really want to draw business they don't put the "not valid with other offers" What if I want five coffees, have five coupons and also want another smoothie. Room for lots of confusion with the teenage barista. In addition to the address and the URL, as an Intelligentsia customer ourselves, I think their use of "Intelligentsia" is confusing in this context - and their couponing strategy questionable to begin with. If you're using Intelligentsia Coffee Roasters as your bean source, you're selling an upscale product - and hopefully service, since training comes with that association (John - you might be interested to know that baristi at most Intelly customers do latte art). So this is sort of like Nordstrom's or Dean and DeLuca couponing. Which of course doesn't happen often. Picky point, perhaps, but it's bothersome to those of us who use the Intelligentsia brand to set ourselves apart from everyone else. And using "Tall" as a descriptor for a cup size. That's SBUX code, not indie. No indie in their right mind uses tall, grande or venti... what are these people thinking? Thanks for your great advice. It's too good to keep buried in a blog post. I'm going to track down Might Joe, print out your comments and deliver them to him. My good deed for small biz. Will let you know what happens.